This package contains an active toolbar that will disable buttons if they cannot be used. This is could happen if the focus-object is not data-aware or if a modalpanel. Please have a look at the readme if you get the error 'DftimerManager doesn't have window_handle!'. This package contains an adapted toolbar object that will shadow toolbarbuttons if the focus-object does not understand the messages sent by the toolbar. This will be the case if the focus-object is not data-aware (e.g. form, grid) and if the objects are located in a modal panel (selectionlist). 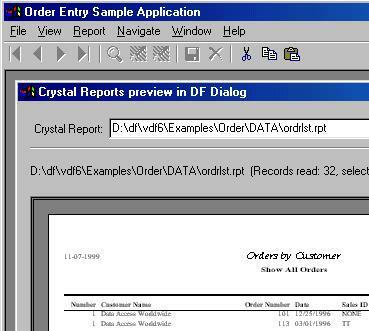 Here's a screenshot of the order entry example program with the active toolbar in action. - Now click on the prompt button of item package name and select the file Activetoolbar.pkg. This will throw up a errorbox that complains about an incompatible fileformat that you will not be able to visually edit this package in the IDE. This is perfectly allright, so hit the Ok button on this errorbox. - Enter 'Active toolbar' in the description field and press the <Enter> key. The external component registratioin is complete and now you are ready to include it into the application. - In the treeview on the lefthand side click on 'Standard toolbar (DfStdBtn.pkg)' and after that select the button 'Change toolbar'. This will popup a screen listing the 'Active toolbar' we have created. So select it. This step is necessary because otherwise your program will generate an error "DfTimerManager doesn't have window handle!" if you close it. - Compile the program and run it to see the results. If you want to use this package in VDF7 or VDF8, you will need to use the package ActiveToolbar7.pkg instead of ActiveToolbar.pkg.